At long last Bishop Auckland ended a nomadic eight years by moving into their brand new home, south-west of the town in Tindale Crescent. Bishops played at one of the country’s oldest football grounds - Kingsway, which they shared with the town’s cricket club between 1886 and 2001. The sale of the “Two Blues” home of 115 years was meant to proceed the club moving into a brand new ground, however disputes with the local council meant the Tindale project remained unresolved, resulting in Bishops having to ground-share with fellow Northern League clubs around County Durham. The club shared with Shildon at Dean Street for two spells between 2002-2004 and 2006-2008, with a stint at Spennymoor’s Brewery Field in between, with the last two seasons spent at Darlington Road, the home of West Auckland Town. The current ground plans were submitted to Wear Valley District Council in September 2008, with planning permission granted two months later and building work beginning in November 2009. The stadium was named Heritage Park prior to the official opening which took place on 24th October 2010. Sir John Hall had the honour of performing the opening ceremony, attended by season ticket holders, sponsors, shareholders, and VIP's along with 230 children from Bishop Auckland St Mary's Juniors and their coaches. The stadium capacity of just over 2,000 includes 250 seats in the Main Stand. The stand is similar in design to the one at Penrith, having a cantilever roof with no supporting pillars with the clubhouse at the top of the stand overlooking the pitch. The stand is decked out with bright cream walls and blue flip seats with the club crest on each side of the stand and also includes a club shop. There’s full cover at the west side goal, the terrace is seven steps high and has shelter for 472 spectators. The rest of the ground is open with hard standing and grass banking, the far side in front of the Sainsbury supermarket is named Terrace Hill. The stadium has been awarded an FA Category C grade, meaning it is suitable for use up to the Northern Premier League - Premier Division. Bishop Auckland are famed in Non-League football, winners of the FA Amateur Cup a record ten times with and losing finalists on eight occasions. The club formation dates back to 1882 when theology students from both Cambridge and Oxford Universities whilst studying at Auckland Castle, formed a team known as Bishop Auckland Church Institute. 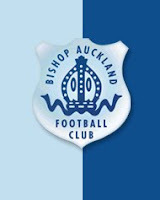 In 1886 a club dispute saw the formation of a breakaway team called Auckland Town, which eventually saw the birth of Bishop Auckland Football Club. The team name changed in 1893 with the club wearing the two shades of blue which represent their Oxbridge origins. Auckland Town became one of the 10 founder members of the Northern League in 1889, playing the inaugural season before joining the Northern Alliance the following season. The newly named club rejoined in 1893 going on to win the league title 19 times coupled with winning the League Cup on 7 occasions. In 1988 Bishops stepped up into the Northern Premier League Division, winning promotion in their debut season in the First Division after finishing runners. The club’s best seasonal performance came when finishing second to Leek Town in the Premier Division in 1996-97, before subsequent relegation saw the Two Blues return to the Northern League in 2006. The stadium’s opening game took place on the 2nd November with a friendly against Middlesbrough in front of a crowd of 1,341, followed by the first competitive game in the Northern League against Consett. Both games ended in defeat and I originally planned to be in attendance for Heritage Park third match against former landlords West Auckland on the 23rd November. Unfortunately that match which was postponed as it fell in the week when the north-east winter officially commenced, then a second attempt against Dunston UTS in January fell victim to a frozen pitch. So my visit to Bishops new home comes in the crazy season, when clubs play four games a week in a mad attempt to finish the season by the 30th April, this fixture being Dunston’s fifth game out of a total of 13 to be played during the month of April. Both teams have recently been in good form and involved in high scoring games so it came as a shock that this game turned out to be Heritage Park’s first goalless draw. Due to the problems with the ground’s drainage system, the pitch was covered with more sand than grass and with the recent dry weather as rock hard as Jimmy Nail. The draw was just about the fair result with Bishops probably just shading the second half mainly due to a diligent effort from Wayne Gredziak (Didn’t he play Ice Hockey?…Eddy) The striker twice outpaced the Dunston defence only to see his efforts go narrowly wide, he also went close with a spectacular over-head kick and late in the game brought out a fine save from the visitors keeper. The result moves Bishops up into 12th position while it’s now 11 games unbeaten in the Northern League for Dunston. Very helpful content, pleased I uncovered this website. Thanks.